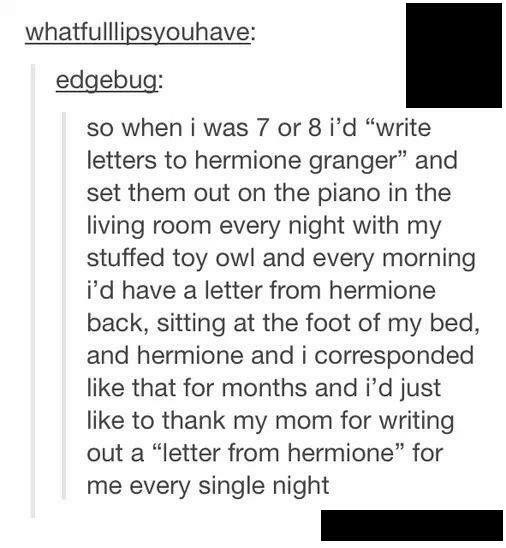 Writing Letters to Hermione Granger Every Night. And Getting Replies. Previous Post: A 9-Year Old Boy Made His Mom A Promise. And A Couple of Days Ago, THIS Happened. What wonderful thing for a mom to do. Love that character in HP. Mind you, she looks like she is about to cane me….that would be fine as well. That, I assume, is her wand though…. Just read the text….sorry for not seeing it. How sweet of your mother to do that! Like the tooth fairy…..